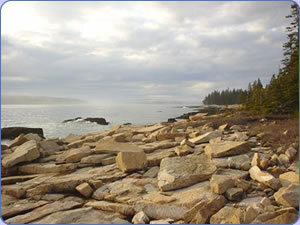 The Crocker House is conveniently located for visitors to take advantage of the sight-seeing opportunities in Bar Harbor, Acadia National Park, Hancock County and the rest of Downeast Maine. By car, we are equidistant from both Schoodic Point and Cadillac Mountain. Potters, weavers and woodworkers are found throughout the area. Antiquing opportunities, like lobster pounds, abound. Information regarding symphony and chamber concerts, auctions, plays and community events is available in our lobby. In addition, Campobello Island and the Canadian border are but a two-hour drive. We are convenient to both the Bar Harbor/Trenton (15 miles) and Bangor (42 miles) airports. Cars can be rented at each location.